Album: "Like Stars in a Neon Sky"
Biography: «Ghost Season is a high energy Alternative Metal band from Athens, Greece. 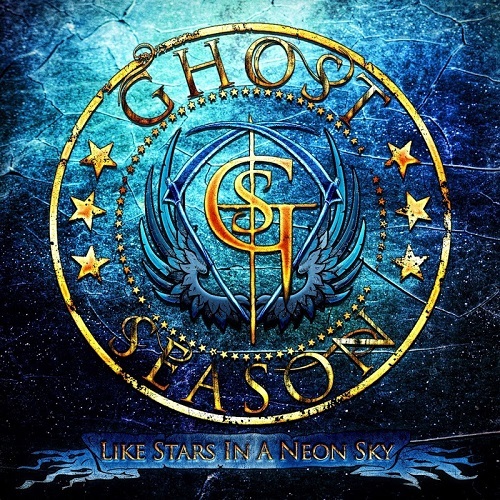 Formed back in July 2013, Ghost Season was an idea spawned by Dorian Gates (bass). Within weeks Nick Christolis (guitar) joined to complete Dorian’s vision. The purpose was to create fresh, new material in patterns of Hard Rock and Alternative Metal music. Among the bands that inspire Ghost Season are Revelation Theory, Shinedown, In Flames, Disturbed, Crossfade, Pop Evil, All That Remains, Alter Bridge ect. The goal of the band is to play dynamic and vibrant music, bridging aggressive and melodic elements while keeping the focus on live energy and enjoyment. Ghost Season completed recording their first EP release “Ghosts like Her”, which was released on September 2014 and received positive reviews especially in the US from fans and critics alike, while they were working at their full length album and scheduling numerous upcoming shows locally in Athens and around Greece. In September 2015, Hercules Zotos joined Ghost Season as their voice and Helen Nota sat on the drummers seat forming the best line-up imaginable for the band. In late 2015, Hercules and the band went in the studio for the recording of their first single titled “Break My Chains” which was released on December 2015 as a first taste of their upcoming album.